Are you looking to integrate your Amazon SES account with Outbound Automation by boberdoo? You’ve come to the right place. Amazon is one of the most popular and certainly the most cost-effective ESPs on the market and it even offers a substantial free usage tier. Follow the steps below to properly configure and integrate your Amazon SES account with Outbound Automation. If you have not already integrated your AWS account with Outbound Automation, you must first complete these steps. Your next step is to integrate your AWS account or IAM user with Outbound Automation. To do so, you will need the Access Key and Secret Access Key that is associated with your account. To follow Amazon best practices, we recommend using the keys for an IAM user. Note: for this integration to work, your AWS account must be set up with these exact specifications. 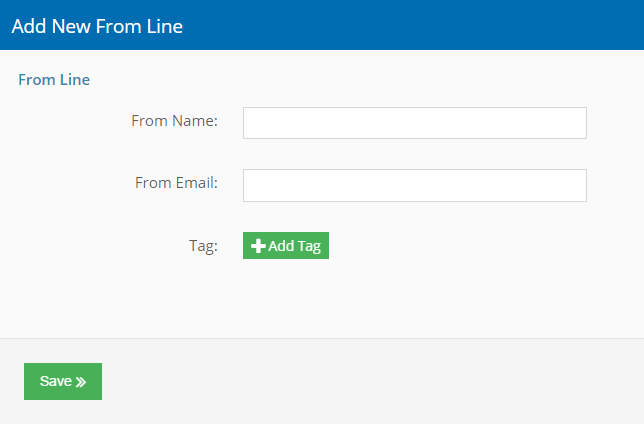 Next access Outbound Automation and click the Setup tab. From here locate the Email Service Providers box and click the green Add New ESP button. 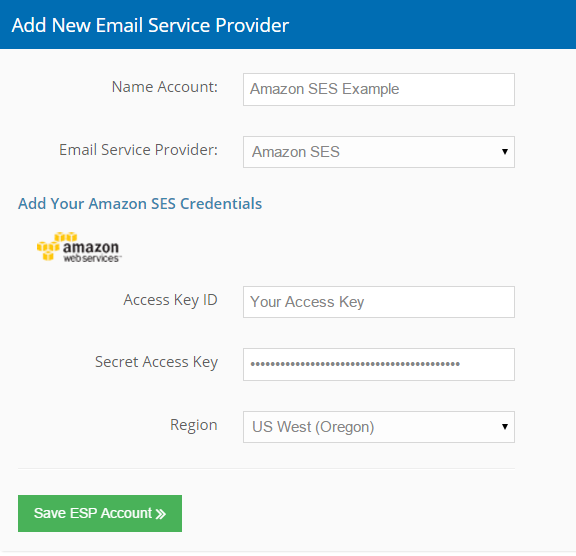 Select Amazon SES from the Email Provider dropdown and choose a name for your ESP. This name will be used for internal reference and organization only. Finally copy in your Access Key and Secret Access Key, select the US West (Oregon) region and click Save ESP Account. When you first register for an AWS account, Amazon limits your sending through SES. Unless you request an increase in sending limits, you will only be able to send 1 email/second, 200 emails/month and only to recipients with verified email addresses. To request an increase in sending limits, select the SES service from your AWS account dashboard. Next, select Sending Statistics from the lefthand menu. On the righthand side of the page you will see the option to Request Increased Sending Limits. From here, you will need to fill out the form and specify your mailing procedures. 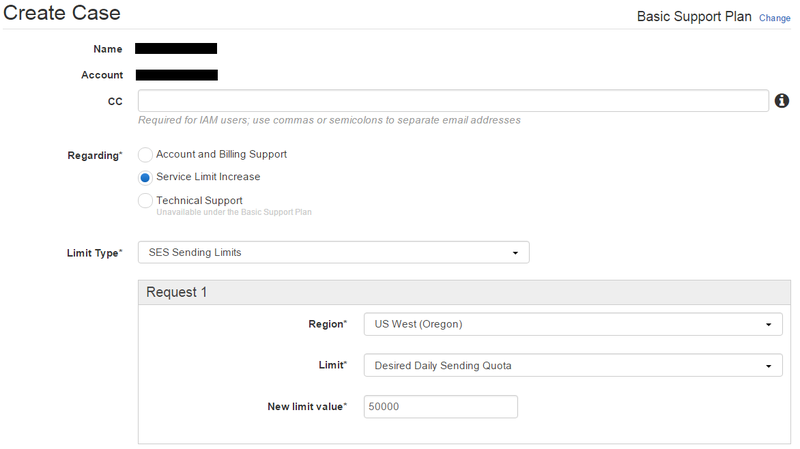 In the Request 1 box, select the US West (Oregon) region and the limit Desired Daily Sending Quota with a New limit value of 50000. Finally, fill out the remainder of the request with the appropriate information and provide your Use Case Description. An example of this would be “We are looking to send marketing emails and our newsletter to our customers.” Once you submit your case, Amazon will get back to you within 24 hours with a response to your request. We generally see this within 3 hours. After your request is granted, Outbound Automation may take up to 12 hours to adjust your sending limits. Unlike most ESPs, Amazon requires you to verify each email address you send from. Because of this, we recommend adding all your sending email addresses into Outbound Automation and verifying them before setting up any campaigns that use this Amazon SES account. To do so, access Outbound Automation and click the Creatives tab. Next select From Line. From here you can add as many from lines as you require. Once you save a new from line, your Amazon SES account will send that address a verification email. Simply click the link in your email and you can start sending through Outbound Automation using that from address. Amazon SES’s free sending tier allows you to send up to 62,000 emails/month for free within your first 12 months. Once you exceed this total, Amazon will continue sending, but begin charging you $.10 per 10,000 emails you send. If you would like to avoid accidentally exceeding Amazon’s free sending limit, we highly encourage you to utilize the Daily Sending Limit feature from the Outbound Automation setup page. Your Amazon SES account is now completely configured and ready to start sending! 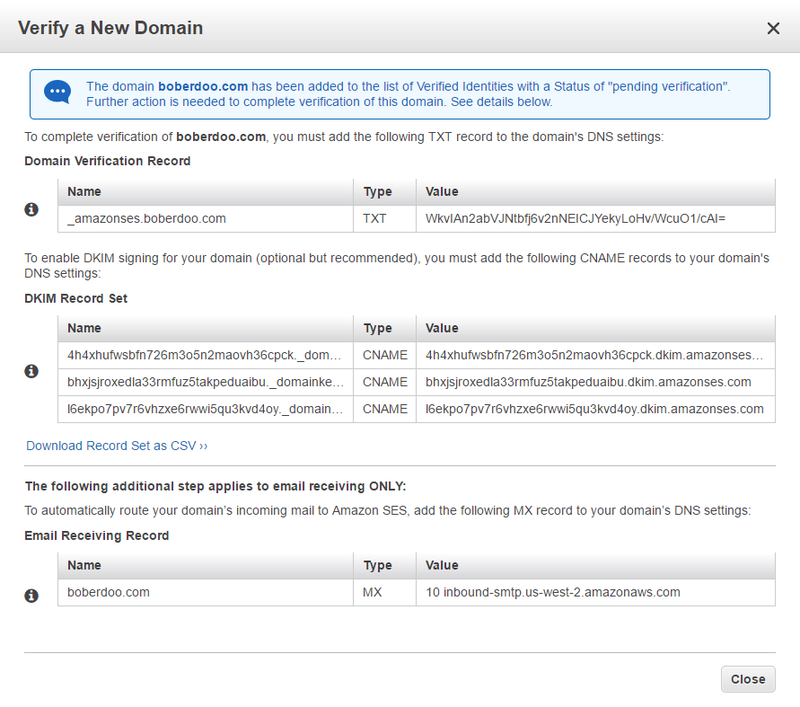 Amazon SES allows you to send emails after only verifying your email senders (see step 4 above). However, as a way to increase your email deliverability, you can verify your entire sending domain. To do this, return to your Amazon SES dashboard and click the Domains tab. Next click the Verify a New Domain button. Type in the domain you would like to verify and check the ‘Generate DKIM Settings’ option. Next, a popup will provide instructions for how to add specific records to your domain’s DNS as proof of verification. Go to your domain’s hosting account. If you don’t know what hosting service you are using, you can look it up here and find your hosting service in the Name Server(s) field. From your hosting account, locate the DNS records or the DNS Zone File. From here, add a new record. Hostname/Host/Name: Copy and paste the Name from the Verify a New Domain popup. Value: Copy and paste the Value from the Verify a New Domain popup. Next, follow these same steps, (but with the CNAME record type) and add the 3 records from the DKIM Record Set section. Once your DNS records are added, it can take up to 48 hours before these changes propagate. Check back to confirm your verified domain. If after 48 hours your domain is still not verified, review Amazon’s email verification docs and check your setup.